A woman with a little baby in a baby carriage. Takes seat with her mother in an outside restaurant. I start eating my meal. Another woman takes seat with her son close to the carriage. She sits, touching it with her back. The smoke streams into the pram. Streams and streams and streams. I am suffocating. Can’t speak. Can’t scream. The meal stuck in my throat. The cigarette-woman has smoked almost all of it. Into the baby’s lungs. Finally the mother gets up, turning the pram around. The smoker squints over her shoulder and it almost looks a little snooty. I don’t know, if I get the situation here. Everyone saw the smoke floating into the baby’s face. The talk was more important, the food was more important, the sitting place was more important and the cigarette was more important; more important than a baby, who could not do anything about it. And I am just the autistic. I do not have a clue. Because I am less empathic. Summer season started. People are celebrating at warm evenings. They are inviting guests to their homes. They arrive after work, around eight o’clock p.m. . They turn the music louder, otherwise they won’t hear it, because of the loud talking. They now shout, because otherwise they won’t understand each other, for the music has concert volume. Someone closes the window with a bam! Someone opens a window and angrily yells: “Hello? !”, then closes the window. I also renounce the fresh air while sleeping. Sleeping? Gosh, it’s 1:00 a.m. and I am not sleeping. Tomorrow’s friday and I’ll have to do some hard tasks, like going to strange places, talking to strange people, hoping my selective mutism wouldn’t catch me, which mutes me off now, in front of my neighbor. The child above my appartment woke up too, now rumbles sleepless across the floor. 2:00 a.m., the party’s still going. House rules, house rules….it echoes in my head. My heart beats fast, so full of anger, until I finally fall asleep. Four days a week on average it goes like this. It is normal, that the rest needy pay for the fun of a majority. I don’t know, if I got the situation here. But I am just the autistic. I do not have a clue. Because I am less empathic. I just think, empathy ain’t worth anything without active participation. In these times of ‘Autism Speaks’s’ disgraceful messaging, tortureful ‘behavoural therapy’ methods, investigations in ‘how to prevent a part of human kind from living’ and money raising organizations, making a market out of our neurology, treating humans as objects, it is hard at some days to make a positive statement as an autistic person. In my personal case, -things should start with being personal-, there is a benefit, that makes me see the beauty above, even in the darkest depths. An archive of what I call ‘the little enlightening’, which forms a constant ‘well of life’. Nobody can take that from me. I have my renunciations, but I still feel privileged. My ark is a manifested source in the nature of things. human societies can’t take the most tiny moth away, no matter how many forrests they will burn or how much torture they’ll bring to me. I won’t save the moths, the daisies and seashells for me alone. I will keep them for my tormentors too. Maybe once, there will come a time, when their descendants need the remembrance of all the creatures their fathers and mothers have wiped away. I don’t need no researcher to show me the figment of my genes. They are physical, changeable and vital. And they have their own memories. And they aren’t just genes. They will preserve the golden core of life essence. we no longer need to fear. Until the day we will be extinguished from this earth, there will always be conciousness and awareness enough. “Everything is okay, Beth”, they tell her. “Look at all the things you’ve got!”, they tell her. Beth is a 24 years old Kanner autistic woman, who loves coffee, Michael Jackson and painting flowers all day. She works in an art and handcrafting studio for disabled people and likes it a lot. “I’m gonna come see you again, Beth.”, I answer. I know. I am autistic myself. There can be great people around you, they’ll always try to support a disability instead of you, the autistic. 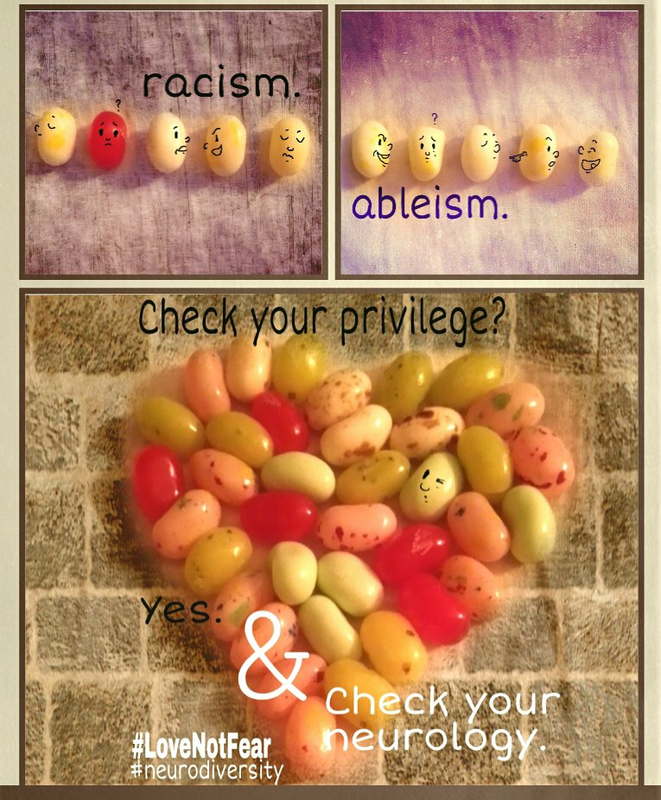 They get, that you have needs that differ from their own. And those are so exhausting and impossible to cover up. So they’d forget about understanding them. But they’d never get the point to support you, like a friend, a daughter, or a partner and let you experience the same understanding. Because thinking in different patterns and using the heart to listen, ain’t an option. Their exhaustion places on top of the communications agenda they note for you. And so you’ll be left with those halfly hearted words. No. They don’t love me. They love me in their minds. They love me in a fairytale. But the love you experience in your everyday life is a privilege, I will never get. And so Beth comes to work, starting to cry. Her mom has so much things to do since years. She did not visit the studio in between a time period of two years. She came to see two exhibitions of her daughter, telling the people stupid nonsense about autism (don’t know the heck where she catched it…Autism Speaks?). The rest of the time she spends to sooth Beth’s anger about sitting home alone every single afternoon, stimming time away, and it turns to depression. They will stop explaining things, once they failed. They will touch you like a piece of wood and wonder about your stimming or your overload over and over again. They will stop interacting with you. until the day they might get special needs. But wait…I am wrong! I don’t have a loveless life. Ironically it’s Beth who gives me the feeling of true love and support. For some little moments in a long life time, I finally feel completely seen and taken and loved as and for the person I am. She does not need to say “I love you.” She does. And that’s what makes her a part of my life. Parents, friends, partners…they passed me running in anxcious cry for help. Now I grew up without them. Now I let them run. It`s been a while, since the first protests against ‘Autism Speaks’ occurred. Everyone can re-examine the wikipedia site about ‘Autism Speaks’, where it started, what their goals are and that there are two people, having a dream… to CURE autism. To cure their children from having special needs. Many many autistic people have gone into selfadvocacy, spoke out, explained why autism is not cureable and why it is not desirable or even ethical, to manipulate natures ways of creating people the way they turn out to be. That autistic people ARE people, whole people, different, colorful in their spectrum and that the simple try, to ‘breed them away’ is equal to euthanasia. Yes, autistics are a ‘human race’, if you want. 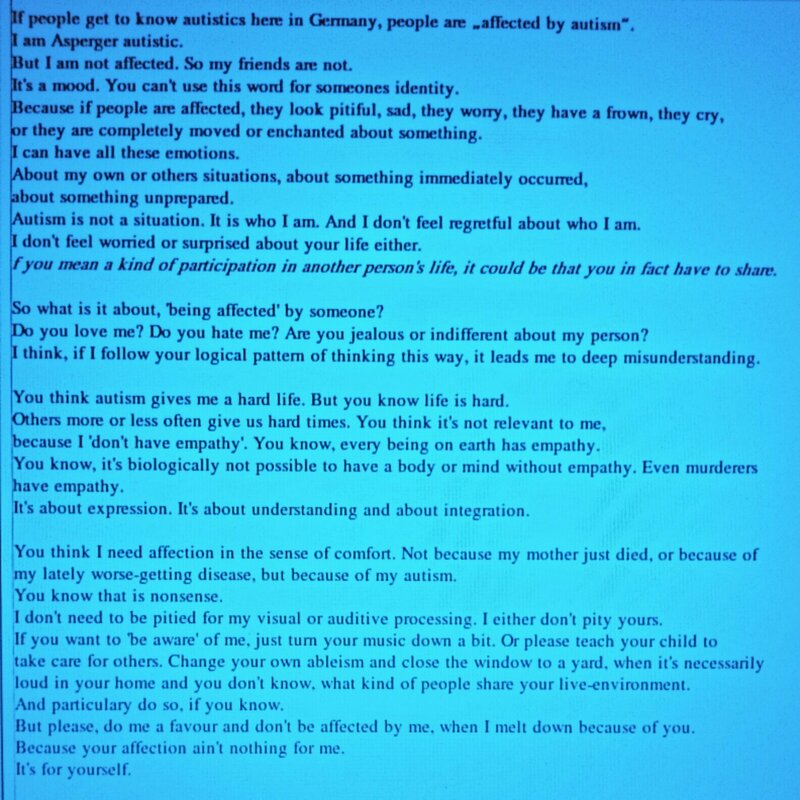 And same as the human society – sorry… the neurotypical society… has great troubles with accepting people with different skincolors and seeing them as equal, they never learned yet to accept and handle people with different neurologies and or ways of being. This is not about healing someone to make him/her feel better and have a good life. This is about manipulating a lifeform to make him or her live a life that is seen as normal. It is normal to behave unconspicious. It is normal not to question things. This is how it’s possible, that an organisation like ‘Autism Speaks’ (we might now turn it into ‘Euthanasia Speaks’), can continuously obtain funds for research and provide for their basic financially, while thousands and thousands of people in the world are silenced in their indignation. It’s all readable. This is how it is possible, that you can today still read on the mendacious wikipedia site, that ‘Autism Speaks’ is a non-profit organisation, which we all know by now is A LIE! And this is how it stays possible, that so many normal people are going to donate to make this crime to even grow, because normal people are unconspicious. And being unconspicious means being needy. Those people have troubles to manage their lifes and get along with other people who have other needs. They will ask for help. And they will think that a large company must have answers to their questions. It’s not a new manifestation. It’s a very very very old one. It always worked that way and we all, who live in capitalism, know that. It’s a principle that stays alive, as long as we are supporting it. So once again: Please stop your support. This can set an example to capitalism. This can make the difference to a better world. It’s not hard to fight against them. It’s not hard to stop suppression, incapacitation, exploitation and fraud. All you have to do is to say NO.